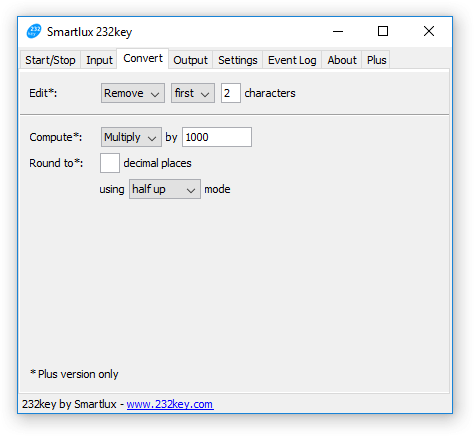 Our popular virtual keyboard wedge software 232key is about to receive a major update with significant user interface improvements as well as new functionality. Input: This used to be the “Interface” tab. It lets you specify from where 232key receives its input, i.e. from which device connected to which interface. Eventually, this tab will also include an option to capture data using custom regular expressions (planned for version 1.7) and further interface options (TCP/IP and possibly USB HID in addition to RS-232/COM port). Convert: Here, you can tell 232key to convert the data captured from the connected device. A new operation allows you to remove (or keep) the first (or last) x characters, which can be useful if your device sends additional data which you do not want to keep. The multiplication, division and rounding operations which used to appear in the “Format” tab can also be found here. All of these operations are optional, therefore you can ignore the entire tab if no conversion is required. Output: This tab contains all settings related to the simulated keyboard (and sound) output (e.g. keyboard type, additional keys to be sent before or after the data). These are the settings from the “Format” tab which were not moved to the “Convert” tab. We hope that the reorganized tabs make working with 232key easier even as we keep adding new features. We’re now going to run extensive tests to ensure that our software works as reliably as ever. We look forward to releasing 232key version 1.60 in the coming week.